Topics: Introduction, Network, Electrical, Air Conditioning, and Data Centre. 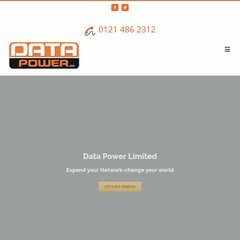 datapowerlimited.co.uk Cat 5e Cat 6 Cat 6a Cat 7 | VOIP | Network Audits | Voice and Data ..
datapowerlimited.co.uk Structured Cabling Systems | Fibre Optic Data and Voice Cabling ..
datapowerlimited.co.uk Structured Cable Installation | Computer Room Audits | Fibre Optic .. The site is programmed for ASP.NET. Its 2 nameservers are ns59.1and1.co.uk, and ns60.1and1.co.uk. It is hosted by 1 1 Internet Ag Baden-wurttemberg, using Microsoft-IIS/7 web server. PING www. (217.160.119.168) 56(84) bytes of data. A time of 133 ms, is recorded in a ping test.